Discussion in 'The Small Company Luthiers' started by casus, Oct 17, 2008. I guess this is my first post on these forums (although I`we been reading posts here for a long time).. 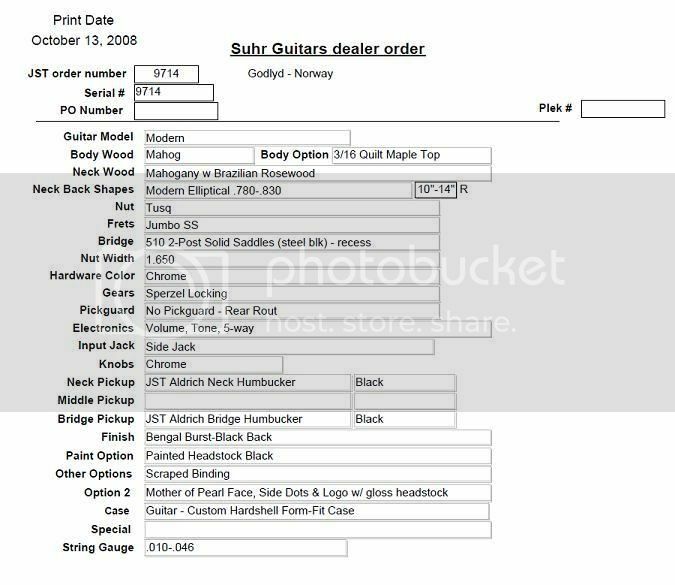 I finally ordered my first Suhr the other day - a Modern! Can`t wait to get my hands on it! Nice, what is a "modern eliptical" neck shape ? Modern Elliptical - A new shape for the 24-fret Modern, this shape can be viewed as a half of an ellipse. It is a fast and sleek shape yet has enough girth for you to really grab onto when you want to dig in for wild string bends or playing chords. The Modern Elliptical shape is available in two thicknesses: .780" to .830" and .820" to .870". Sounds like a killer guitar you have just ordered, Suhr is definitely one of the best there is! Been without an electric for 6 months now... Can`t wait to receive this beauty! Hey casus, I played a couple of Suhr's at Godlyd's storefront recently - I don't think you will be disappointed! How did you arrive at those spec's? Did you communicate through Deb at Godlyd, or directly with Suhr? This is actually the second Suhr i have ordered. The previous one was last year (this one: http://www.godlyd.no/default.asp?page=14&product=2747&p2747_v=1 ). The last one didn`t come out the way I wanted it to (some miscommunication here and there..), so I decided to cancel the purchase. The Modern I`we ordered now does basically have the same specs as that Standard - with some small changes. 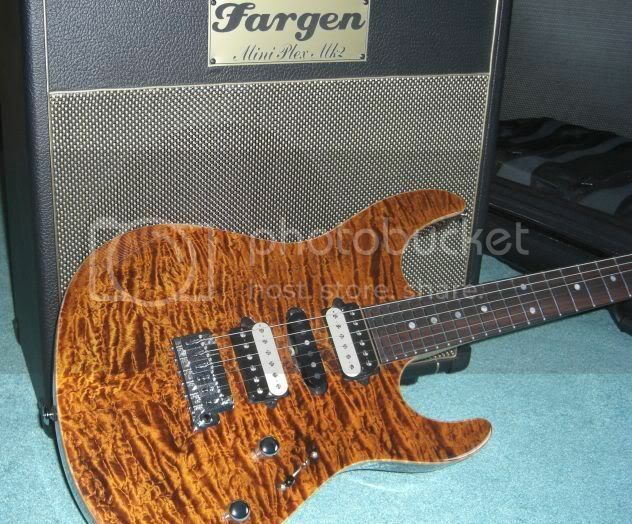 my last Suhr, now sold, was plek'd and had superb set up and action. Bought another one from an indivdual that was not plek'd. Like yours the plek box on the spek sheet is blank. the new one has considerable more fret buzzies and though I keep tweeking on it can't seem to get the action nearly as low and clean as the previous. My point is, if they have a plek machine, why the heck don't they do all their guitars??? I am pretty sure they do. The plek box cannot be filled in at the time of order as it is not done yet. I would call suhr and ask for help and send your guitar back to suhr if you can live without it for a bit and the price is something you can live with for him to plek again. A plek will not last much longer than anything else as far as a setup goes. Maybe a little longer cause tension is perfect etc. Once you get climate change and time, change your brand or guage of strings, and all the other reasons, it will go out like any other setup I would think. Besides, the plek machine just gives indications about how the setup should be for an optimal setup. Particularly nut, fret dressing and neck relief. The machine also dresses the frets for optimal setup (and this is the biggest point with a plek setup, because it assures you that the frest are at a perfect level). But the biggest part of the setup is done by human hands. And an optimal setup for the machine and luthier who´s taking care of the setup doesn´t mean it´s the best for you. This depends on other variables that the plek machine doesn´t know: how hard you play and your playing style, for example. Having played my brother's Suhr, I'm sure you'll be very happy with it. Good choice, you won't be disappointed. Suhr makes one of the best guitars, for Suhr. I luv this one. Just got my first suhr a few months ago. It is well worth it, they make unbelievable guitars, they just beg to be played. I have been searching around for a modern for a while and I would get mine almost identical to yours except with the gotoh floyd. That is the neck carve I have been checking out too let us know how it is when you get it. Will post pics and vids (as soon as I get myself a new amp). I`m thinking Diezel Einstein or perhaps a Cornford Hellcat?